One of the biggest joys of watching The Force Awakens was seeing the beloved characters of the Original Trilogy brought to life once again. While Han Solo took a lot of the spotlight, a scoundrel is nothing without his Wookiee. Yes, Peter Mayhew also reprises his role as Chewbacca in the film. but it should be know that he did not do it alone. "I loved doing theater in high school. But I just didn't believe my chances to get any acting part were possible because of my size, so I studied more behind the camera." "I took three trips there [during the audition], and on the first time I got more details and realized what my role would be." "I will never get into it. That's for people to guess and figure out." "That was a horrible day. I immediately tried to lift it, but it wouldn't even move. It was stopped by an emergency button, but none of us knew that. We were all freaking out. But [Ford] was great, he wanted everyone to not worry about him." Warning: Major spoilers for The Force Awakens ahead! "It was a tense feeling on set. Everything was much more quiet than usual. Between takes, no one would talk much. Watching Harrison and Adam Driver do the scene was emotional." He also added that he plans to continue doubling for Peter Mayhew as Chewbacca in future Star Wars films. Be sure to read the full article with Joonas Suotamo on Business Insider! 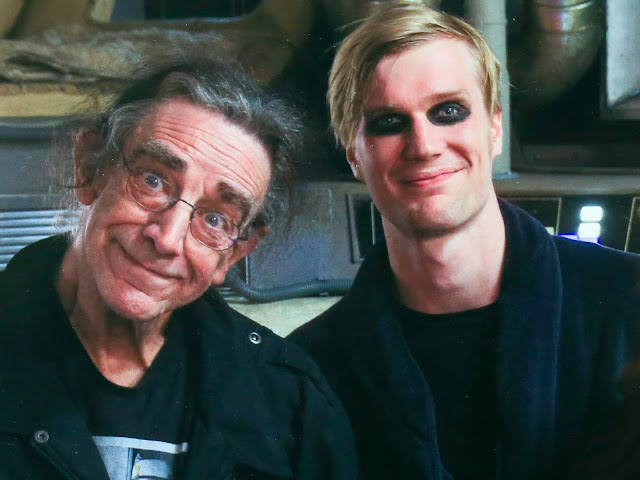 I have a lot of respect and admiration for Peter Mayhew. Still I like the idea of a double doing the scenes he may not be able to perform so he may learn from him. Chewie is an essential part of Star Wars and I would love to see perform more physical stunts, fighting with his hands, running, firing big weapons, carrying injured and piloting for many movies to come. I really hope this trilogy is not the end for the wookie. I would really like if Joonas Suotomo shares the mantle as he did on EVII and maybe in another 5, 10, 20 or 30 years after Episode IX he may be the name called to reprise the Chewie. I would hate the idea of having a different Chewie in each movie. This is totally awesome. Had no idea Peter had someone else to do the more strenuous scenes. Absolutely wonderful and you can't tell which is Peter and which is Joonas. He mirrored Peter's moves perfectly. Well done.